West Indies beat England by six wickets today in Group 1 opener at ICC World T20 in Mumbai, it was a batting masterclass from Chris Gayle after he knocked England fielders all over the place. 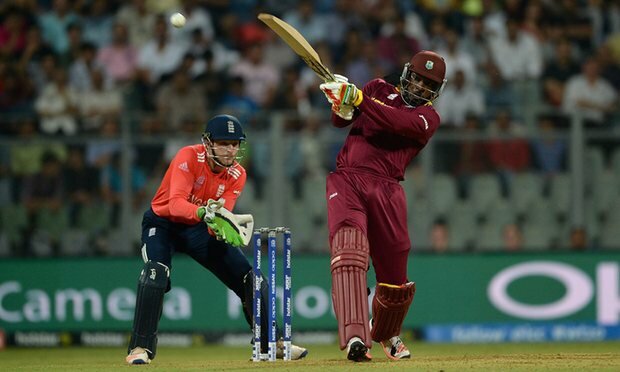 England set the Windies a total of 183 runs to win, Eoin Morgan’s men failed to score big runs. Joe Root’s (48 from 36) was England’s top scorer, though Jos Buttler (30 from 20), Alex Hales (28 from 26) and skipper Eoin Morgan (27no from 14) all chipped in with runs. But it was a remarkable innings from West Indies Chris Gayle that gave England no chance of winning, he smashed 11 sixes as they beat England by six wickets this afternoon. England were put in to bat first, they made 182/6, but Gayle simply took their attack apart and made it look easy with his 100 not out from just 48 balls. Chris Gayle became the first player in Twenty20 Internationals to score two centuries in the World Twenty20. He smashed 117 in the 2007 World Cup against South Africa in Johannesburg. READ: Leaving Jofra Archer out of the England team a big mistake?